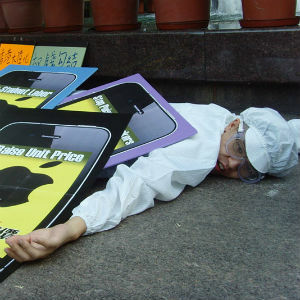 Front Page » Business » Is it true that Apple gets around U.S. labor standards and laws by outsourcing production to China? Dear EarthTalk: Is it true that Apple gets around U.S. labor standards and laws by outsourcing production to China? Apple isn’t the only tech giant outsourcing much of its production to Chinese manufacturers nowadays, but the sheer popularity of the California-based company’s products makes it an especially easy target for activists concerned about worker health and safety. China Labor Watch and other groups have exposed inhumane conditions at huge Chinese factories of suppliers like Foxconn and Pegatron that support many U.S.-based tech firms. Workers at these facilities, many who are underage, are often required to work 18-hour shifts and are routinely exposed to toxic chemicals—but still can barely make ends meet. The problem came to a head in 2010 when journalists got word that 14 workers had committed suicide at Foxconn’s massive iPhone-assembly manufacturing facility in China. ​Despite knowledge of the dangerous conditions, Apple’s Chinese suppliers rarely struggle to find workers, many of whom are willing to take the relatively high paying jobs despite the risks—especially if they are supporting loved ones at home who depend upon the extra money to survive. China’s huge population creates an infinite supply of workers, such that even a large-scale walkout would be pointless. The assembly line system gives each person a repetitive, simple job that can be taught in an hour.